Telling whether an odd looking mole is a melanoma is a real challenge. In fact, the only sure way to know is with a biopsy. But, before you get them all cut out, there are signs and symptoms that can help you and your doctor to make the right decision. According to the National Cancer Institute there are three main kinds of moles you need to know about: a common mole, a dysplastic mole, and a melanoma. A common mole is a small growth on the skin usually found above the waist on areas exposed to the sun, and rarely found on the scalp, breast, or buttocks. If you have more than 50 common moles you have a greater chance of developing melanoma. That said, most common moles do not turn into melanoma. This dysplastic mole has a raised area at the center that doctors may call a “fried egg” appearance. This dysplastic mole is more than 5 millimeters in diameter. Dysplastic moles can occur anywhere on the body, and although are usually seen in areas exposed to the sun, they can occur on unexposed areas. People with dysplastic moles usually also have a large number of common moles. There is a risk that a dysplastic mole could turn into a melanoma, but most don’t and remain stable over time. However, according to statistics, the risk of melanoma is over 10 times greater for those with more than five dysplastic moles. If you have dysplastic moles doctors recommend checking once a month for any changes, and for people with over 5, they should be photographed every 3 months. A photograph is the best way to check for change in a mole. Melanoma is a type of skin cancer that begins in melanocytes. It spreads quickly and the earlier that melanoma is detected and removed, the more likely that treatment will be successful. A melanoma can develop from an existing mole, or appear as a new lesion. If the colour, size, shape, or height of a mole changes or if it starts to itch, bleed, or ooze, you should tell you doctor. 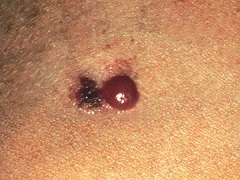 In men melanoma is often found on the head, neck, or back. In women, it is found on the back or lower legs. The first sign of melanoma is a often change in the shape, colour, size, or feel of an existing mole. 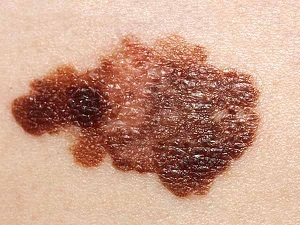 Melanoma can also appear as a new mole. The best way to identify a melanoma is to know whether it has changed.Which is what we do here at Skin Analytics. But if you’re worried about a particular mole right now, you should not wait till it changes. Colour is uneven. Shades of black, brown, and tan may be present. Areas of white, gray, red, pink, or blue may also be seen. Diameter. There is a change in size, usually an increase. Melanomas can be tiny, but most are larger than 6 millimeters wide (about ¼ inch wide). Here are some photos of melanomas. Compare them to the common moles and dysplastic moles and see if you can spot the difference using the ABCDE technique. We’ve given you a lot of information: here’s a great summary of all the important information from the National Cancer Institute. Remember, its important to check your skin regularly, melanoma is curable if you catch it early! How big are they? Usually less than 5 millimeters wide, (not as wide as a new pencil eraser). What colour are they? May be pink, tan, brown, black (in people with dark skin), or a colour that is very close to a person’s normal skin tone. The colour is usually even throughout. Is it cancer? No. A dysplastic mole is more likely than a common mole to become cancer, but most do not become cancer. How many people have dysplastic moles? About 1 in 10 American adults—about 30 million people—have at least one dysplastic mole. What colour are they? May be a mixture of tan, brown, and red or pink shades. How many people have melanoma? Melanoma is much less common than other kinds of skin cancer. But every year, about 2 in 10,000 Americans—more than 70,000 people—develop melanoma. More than 800,000 Americans alive today have been diagnosed with melanoma. What colour are they? Usually uneven in colour. May have shades of black, brown, and tan. May also have areas of white, gray, red, pink, or blue.